There are several ways that you can advertise in Facebook, but you get the best result when you do paid ads with Facebook. Just like word of mouth Facebook will deliver your message to thousands of people while building a targeted list which you can offer your products and services to them. Just building a listing Facebook is not enough and you have to constantly engage with your list to convert them to sales. There are two main ways that you can generate traffic cure fan pages. regardless of what method you choose, we recommend to having a business fan page. If you want to build your list organically, you need a fan page regardless. Here is how it works. Organic method: after creating a fan page, you search for other fan pages that have audience that are in your niche and try to bring them to your page so they would like your page. You need to manually join a lot of groups and fan pages that are in your niche, like their fan pages, comment on their posts and more and after they join your page, you need to engage with them by posting great articles, so they like and share it to increase your number of fans. You have to make sure that every article that you post is quality so you gain the trust of your fans. Once you gain their trust, they’ll buy anything that you offer. Side Ads: the side ads are the kind ads that show up on the right side of your fan pages. You can redirect the visitor to an external page or to your fan page within Facebook this can also be set up the way so when visitors click on it, they become your fan and you will be able to increase the number of fans you have. This is the fastest method of increasing your fans and building your list. The cost of the clicks will reduce significantly if you keep the traffic within Facebook. Newsfeed Ads: this type advertisement is very powerful and dad show up in the newsfeed section of your targeted audience with much bigger pictures and even video. 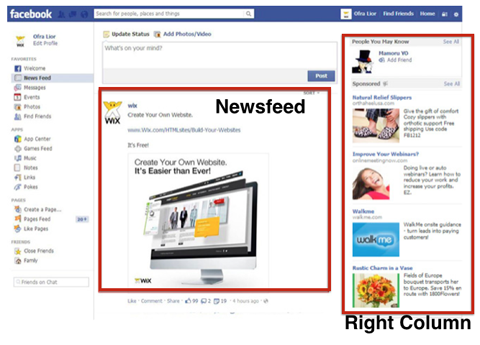 Newsfeed ads could also get forwarded to an external link, a landing page or fan page within Facebook. No matter what method of marketing you choose with Facebook, you need to know how to engage with your audience so they would like and share your content. Also your ads should be set correctly in order for you to get targeted visitors to your page, otherwise you’ll be losing a lot of clicks. Our team of professional Optimizer is specializing Facebook ads to bring laser targeted traffic to your site for your fan page and know how to engage with your audience to generate sales. We manage your ads the way so you get the maximum exposure with minimum cost while bringing laser targeted traffic to your website of fan page. Please contact us at (866) 311-8812 for more info.